Do birds of the same species look alike throughout their ranges? You might think that a species, by definition, would look the same wherever it was, but in fact most non-migratory birds differ within their ranges. Birds of a wide-range species that live in the cold end of the range tend to be bigger than birds that live in the warm end. 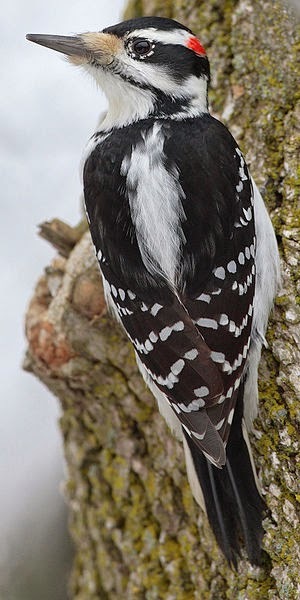 A Hairy Woodpecker from Central America is noticeably smaller than a Hairy Woodpecker from Canada. Larger birds tend to be able to conserve heat better than smaller ones. Over many generations smaller birds born in cold regions have been more likely to die from mid-winter cold, leaving the larger siblings to carry on the species. The process of size variation doesn’t take all that long, either. The House Finches, introduced into North America in the mid-1800s, have already developed smaller versions in the southern United States than are found in northern states and Canada. The tendency of a species in cold climates to be larger than its fellow members in warm climates applies not only to birds, but all warm-blooded animals. In fact, it is a scientific principle is called Bergmann’s Rule, named for 19th Century German biologist Carl Bergmann, who developed it. A similar principle is called Allen’s Rule, which says that cold-region birds have shorter wings, beaks and legs than those in the warm regions – all techniques, again to conserve heat. Gloger’s Rule is not about size, but color. In 1833, Wilhelm Gloger, a German naturalist, postulated that, due to the intensity of the sun, warm-blooded members of the same species living in warmer climates tend to be darker than those in colder climates. It works for humans and other animals including birds. Birds of a single species that ranges from cold to hot will have deeper feather colors in the south than in the north.